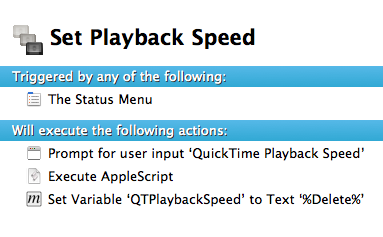 If you’re watching “some keynote” or listen to a podcast and want quicker playback, iTunes actually can’t do that, but QuickTime can. Unfortunately not directly in the app, but with a little bit of help of AppleScript it can. I wrote a little Keyboard Maestro macro to dynamically set the playback speed. The macro asks for the playback speed multiplier when its run. I found this method to be only half-baked, because when you press ⌴, the video plays at its normal speed. So I made two more macros. One captures ⌴ and triggers the AppleScript that tells QuickTime to play at the altered speed, and one that cleans up the variable used in the AppleScript when QuickTime quits. Some bugs to resuming playback, in case the Keyboard Maestro variable the macros use is not existing or set, have been fixed in the last version. A commenter wrote that a ⌥-click on the forward/backward arrows speeds up the video in 0,1 increments. Thanks!